When listing items on etsy, the potential buyer cannot pick up the item, look at it from all sides. Their only visual is the photographs. I think the images used to represent an item are actually more important than the actual item. The most carefully created item with impeccable attention to detail will never show these qualities to anyone if the picture is mediocre. I suffer from Mediocre at Best Photographic Syndrome. I am working very hard at overcoming this affliction. However, I don't have a super fancy camera or a great location or an elaborate light box set up. I also don't always have the luxury of photographing items outside in optimum light. I use what I can find, wherever I happen to be. Some of my shots are pretty darn good, but they were taken outside, or at a location I just happened to be at...in short, not something I can use on a consistent basis. So, what now? Getting creative is the key. I took pictures of my new smoosh hat inside, since when I had a few minutes it was 10:30 at night. 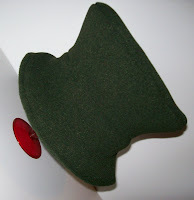 Using 2 pieces of foamboard for the background, I got on the floor and moved this way and that way to show the hat but not the worn upholstery on the recliner that the foam board was leaning up against. I also wanted to avoid showing the shelf of coloring books and crayons next to the chair. As I was rolling around on the floor, I accidentally snapped a picture of the hat. It wasn't straight. It was tilted. It was pretty arty/creative looking. It was click worthy to me. It became the first photograph of my new hat. I too have problems with my photography. I think you did great!